About a month ago, I discovered an incredible yogurt. I know this doesn’t sound like a terribly exciting event, but I take life’s joys where I find them. 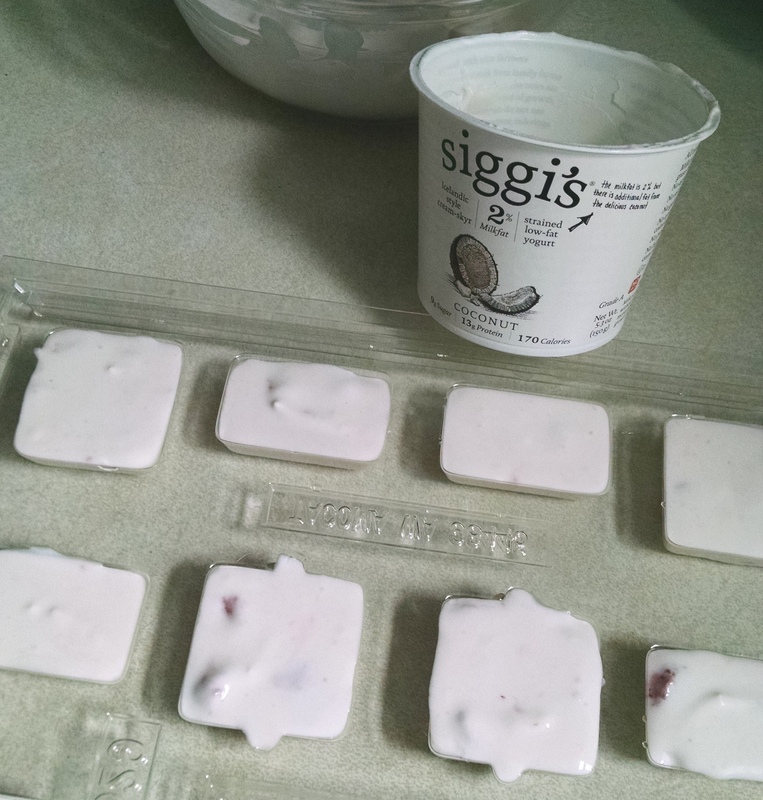 The brand is siggi’s, and what they make (among other products) is an Icelandic-style yogurt called skyr. Jammed with protein like Greek yogurt, it also goes a step further on the awesome scale by being strained to the most silken texture I’ve ever encountered in a dairy product. What I find particularly great about siggi’s is that they really care about what goes into their food (and what doesn’t). The ingredient list is short, free of any artificial flavors or sweeteners, and generally light on sugar. This means the end product is packed full of flavor and deliciously tart. While I’m perfectly content to just spoon it directly into my mouth, I thought I’d try out one of the recipes they have on their site. I tweaked it just a little bit, and the end result was a quick and simple frozen treat. 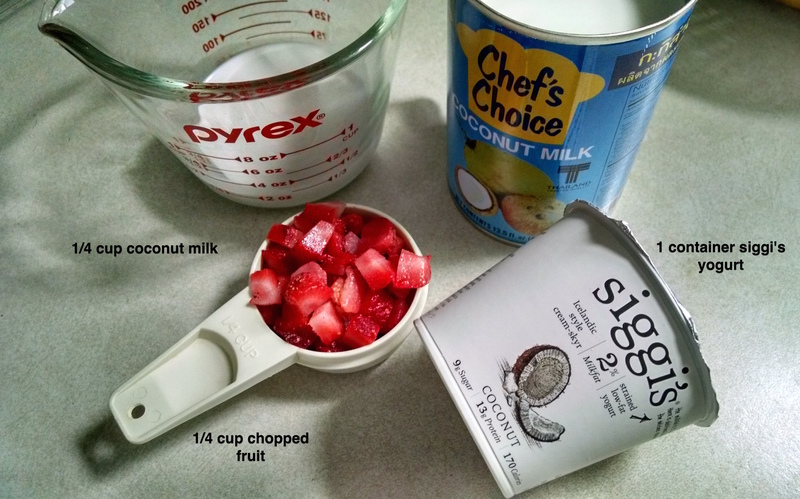 All you need is 1/4 cup chopped fruit (I used strawberries), 1/4 cup coconut milk (full-fat, from a can) and one 5.3 oz container of siggi’s (my choice was coconut, in keeping with the theme). Mix all the ingredients together in a glass or ceramic bowl. This is an important distinction, because no matter how well you wash plastic bowls they are still porous and absorb all sorts of things. Using glass or ceramic ensures that no flavor ghosts from recipes past make their way into your tasty yogurt. 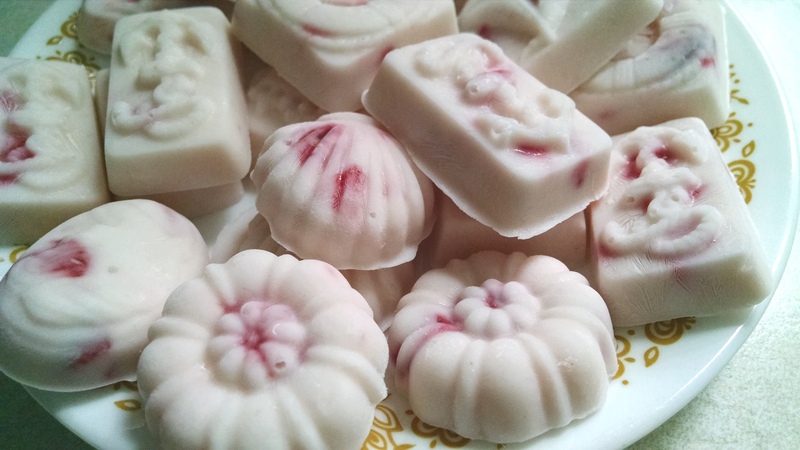 After the ingredients are well combined, spoon the mixture into a decorative candy mold or ice cube tray. I went with a nautical mold, because why not. My mix filled about 1.5 trays, and I’d say the trays I used were for relatively small pieces. With larger shapes, it would likely just fill one tray. Then all you need to do is find a nice level spot in the freezer for these little guys to set. They’ll be soft set in about 30 minutes, and more solidly set after two hours. I find it’s best to let them defrost ever-so-slightly before eating them (for maybe just two or three minutes) so that they’re easier to bite into. Aside from the tastiness, a great reason to make something like this is to help with portion control. When you want a little treat, you can take a few yogurt bites out of the freezer to satiate your craving without any guilt. Add to that the fact that siggi’s is certified kosher and gluten free, plus they only use milk from grass-fed cows, and you have yourself a healthy snack that you can feel good about eating. While it’s not available in every store, siggi’s is still pretty easy to find. Just in case you’re not sure where to look, you can pop your zip code into their store locator. As an added bonus, when I emailed siggi’s to tell them how much I loved their yogurt (yes, this is totally a thing that I do) they sent me an adorable packet complete with measurement swaps for cooking and a bunch of coupons. I think the best way to spread the love is to pass some of it along to you, so I’ll send a coupon for a free container of siggi’s to the first five people who comment on this post. This looks yummy, I used the tool to determine if/where Siggi’s was sold here in Texas as I have never seen it, we have several stores…yay! Hooray! Glad you’re able to find it in your area. If you send me your address via my contact form (totally private – https://positivelynatalie.com/contact/) I’ll get your siggi’s gift certificate sent to you pronto. Thanks for the great recipe! I love their yogurt and will try the recipe. Your blog is so much fun! One trick I learned when making frozen yogurt treats is to let it freeze in the mixing bowl until it’s stiff but not hard. Then beat it with a hand mixer to break up the ice crystals. At this point, pour it into your molds to freeze solid. The result is a softer ice-cream that is easier to bite into. I still let them sit on the counter for a few minutes before serving. Great tip, Vinny! Thanks for sharing! I still have siggi’s freebie coupons if you’d like to try it. You can send me your address via my contact form and I’ll mail it out to you (https://positivelynatalie.com/contact/). This sounds so delicious! I found out about this brand in 2013 and have been a fan ever since.